Just one of these Omega signed Genuine Elephant bands available. Scarce piece made by JB Champion USA only for the American market for Omega, with a yellow clasp that is unsigned on the top but dual stamped OMEGA and JB on the back. Clasp is marked for gold content of 1/20 10K yellow gold-filled. Discovered as New Old Stock, an unusual Omega vintage piece we had not ever seen before. Ends measure 17.6mm wide to fit the 11/16 inches or 18mm Seamaster Constellation and Omega dress watch models. Price is $275. 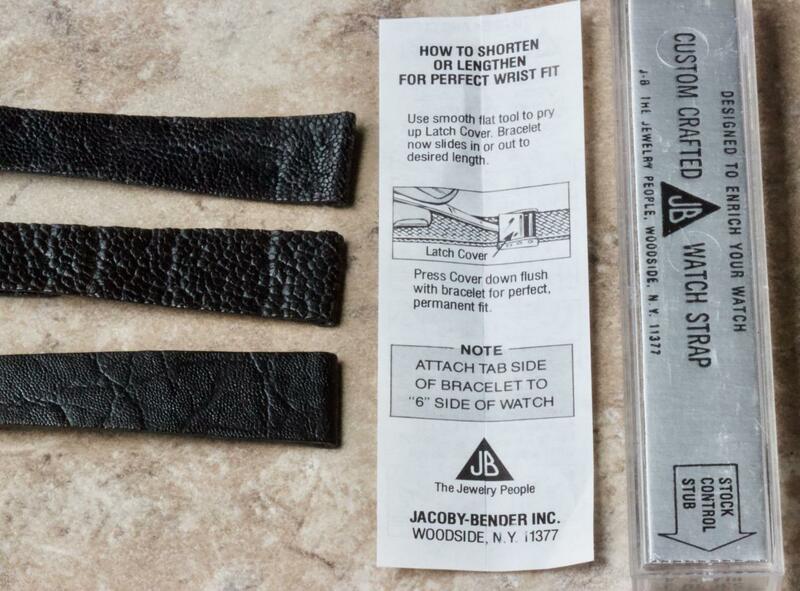 Length and sizing details on the Omega band are the same as the generic JB Champion ones shown below. 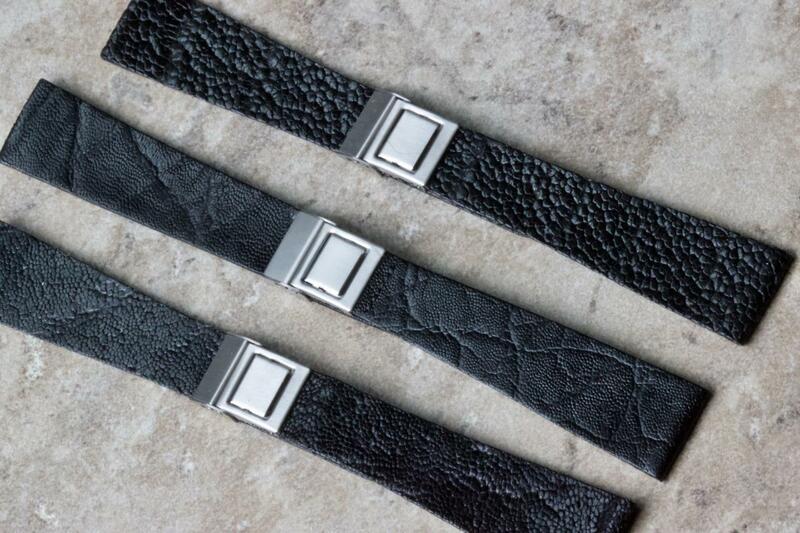 Certain collectors are very fond of Genuine African Elephant watchbands because every one is unique with a different highly-textured skin pattern and they are incredibly durable. These are JB Champion USA new old stock bands from the 1960s. They're great to wear because they come with JB's famous sliding clasp mechanism that allows you to adjust the tension easily. Plus, they are long enough for even the largest wrists and it's easy to adjust these or even trim them as shown to fit small wrists. Available in 11/16 or 3/4 inches (17.3mm-18mm or 19mm) in black or dark brown, with steel or yellow gold-plated clasps. Email billmahoney@aol.com for more sizing information and photos. 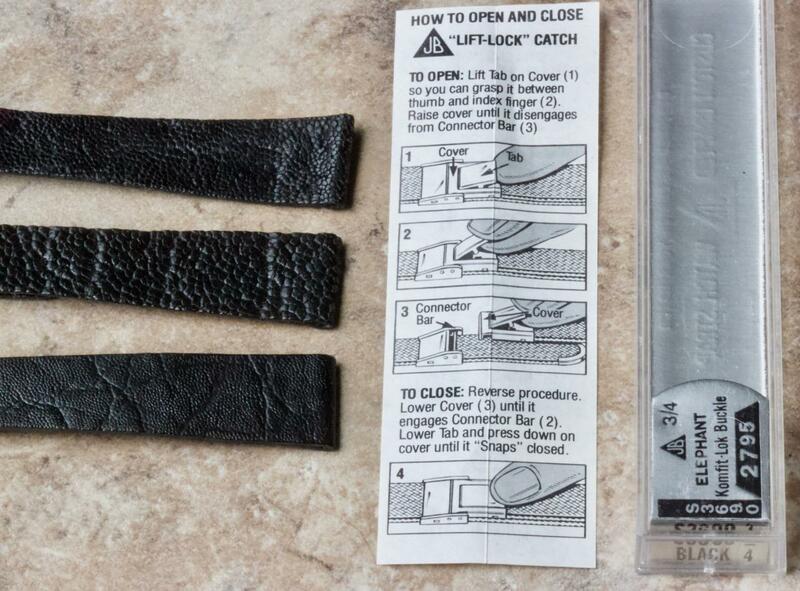 One of the most rare old stock vintage watch bands to find, and especially rare in a Long Length like this. Produced in the 1960s/70s and discovered as vintage New Old Stock. 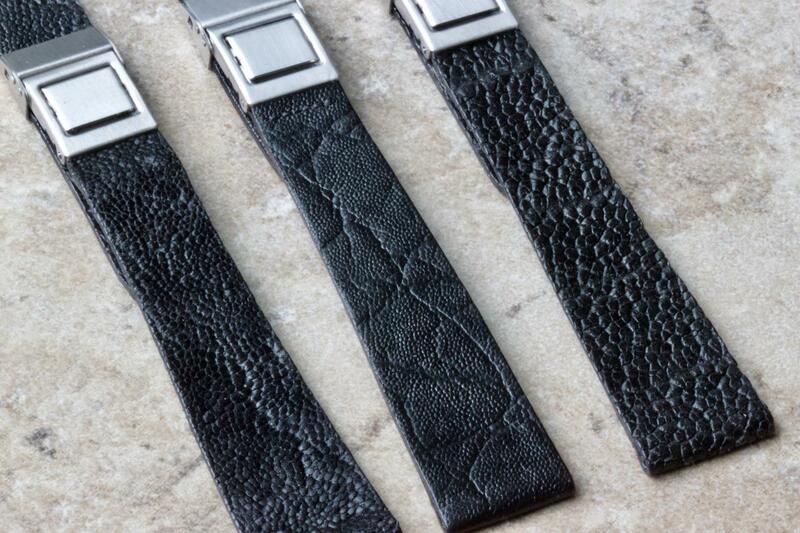 This Exotic Skin is one of the most unique and durable for old watch straps, and these special Long Length versions are very desirable for watch collectors with larger wrist sizes. Finding these in Long Length is nearly impossible. Nice deep texture to the skin. From a time when vintage watch bands were made with better materials than what is used today in modern straps. 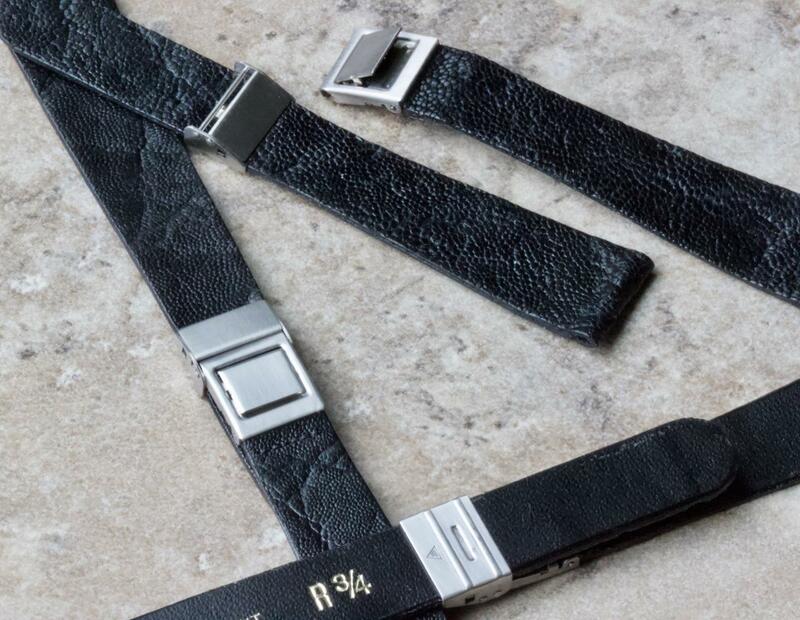 Long Length straps measure 8 1/2 inches (21.8cm) placed end to end, not including the buckle, a full inch more than standard straps. Metric measurements of the two pieces are 128/90mm. 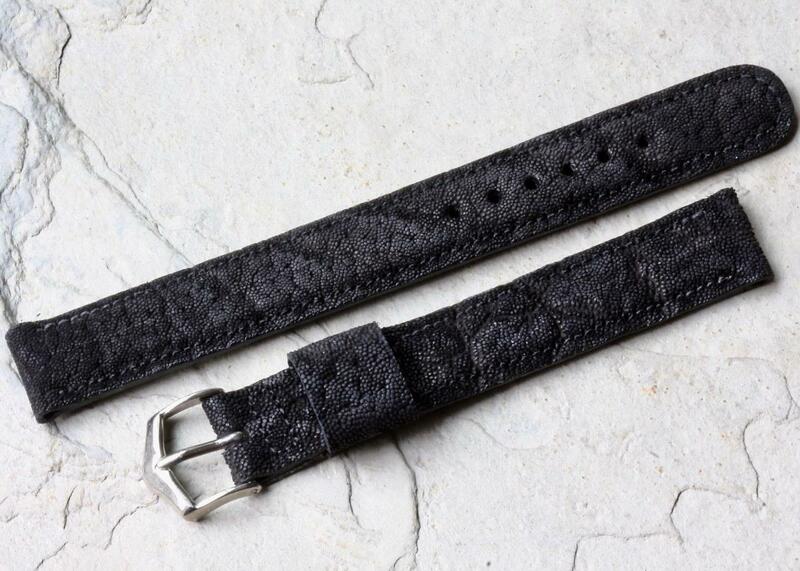 Lightly padded strap that won't detract from a fine watch but has strong thickness. Band is 3.8mm thick where it meets the watch and 3.6mm thick at the tail end. The buckle end width is 16mm. Comes with a unique shape JB Champion steel buckle or you can request a yellow gold-tone buckle. Shipping is $7.99 in the USA or $13.99 via Priority. International buyers email for a shipping quote. Check out our Long Vintage Bands and Exotic Skin sections for more rare vintage watch straps. Most of these are unique items purchased from vintage NOS stock many years ago. 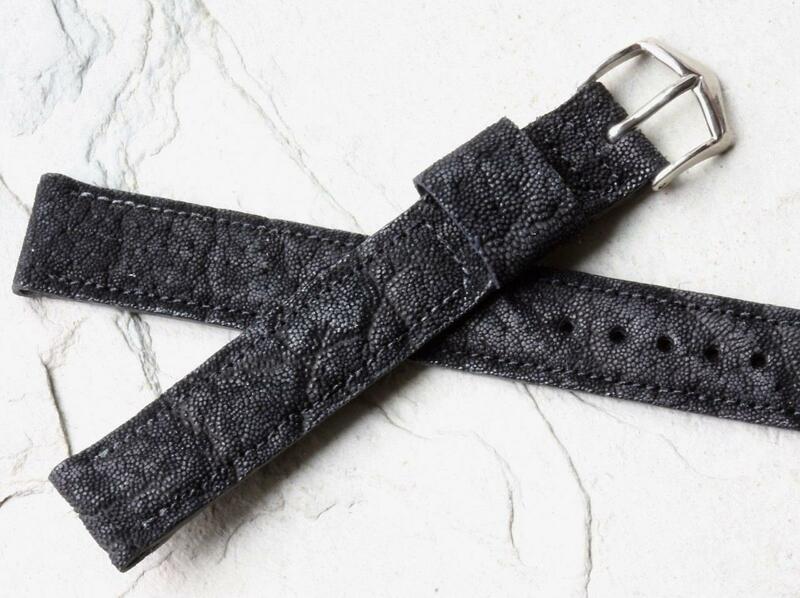 We specialize in selling 100s of Exotic Skin watch bands made of genuine crocodile alligator shark caribou zebu bison deerskin water bison ostrich skin wild boar snakeskin sheepskin buffalo goat skin lizard camel and other Exotic Skins.